Video clip synopsis – Powered by a funding boiler, the current Art Machine features a critic unit, pop tube and entertainment cylinder. 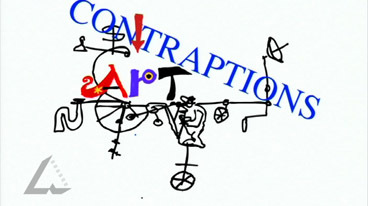 The Art Machine is an episode of the series Human Contraptions (10 × 5 mins) produced in 2002. Academy Award winning animator and political cartoonist Bruce Petty says that ”caricature is a device by which we hope to make complex ideas (at least) accessible, (occasionally) witty and (sometimes) informative”. There is a critical thread to all episodes in the series, but the main aim was to take an impressionistic, shorthand, comic look at over-worked, serious subjects. The series is based on general suspicions people have about the institutions we live in. These bodies are old or biased, often politically disfigured and under-funded – they are familiar targets. Representing them as machines at least suggests they are man-made, they wear out and can be fixed even as they do determine how we live. The first time a human did something not work related, minds opened and imaginations soared. Attracted by the lack of effort art required, soon everybody was trying to do it so a serious French philosophy team was installed to decide what the art contraption was really supposed to do. Finally, business stepped in and now anything, properly marketed, can be art for fifteen minutes. Cartoonists use various persuasive techniques in political cartoons – symbols to stand for concepts or ideas; exaggeration of characteristics of people or things; labelling of objects or people; analogy in the cartoon – what situations does the cartoon compare? and irony in the situation. Identify the persuasive techniques that Bruce Petty has used in his film. What issue is this cartoon about? What do you think his opinion is on this issue? What other opinion can you imagine another person may have on this issue? Did you find this film persuasive? Why or why not? What other techniques could the cartoonist used to make it more persuasive? Are any of the images being used as a symbol to stand for a larger concept or idea? If so, what is the meaning of the symbol? Are there any images of famous places, famous people or famous images? If not, what images are present? Does the writer label anything in the cartoon? If so, what is the importance of the label? How is the cartoonist using any other artistic techniques (irony or exaggeration) to express his opinion on the issue? What message is Petty trying to convey in this cartoon? What evidence in the cartoon supports this message?